You will love my Short Ribs in a Sweet and Spicy Sauce – tender, juicy, falling apart, braised beef in a flavourful, as spicy as you like sauce. My Short Ribs in a Sweet and Spicy Sauce taste great, whether it’s freezing cold outside or baking hot – ’cause they are flexible like that. 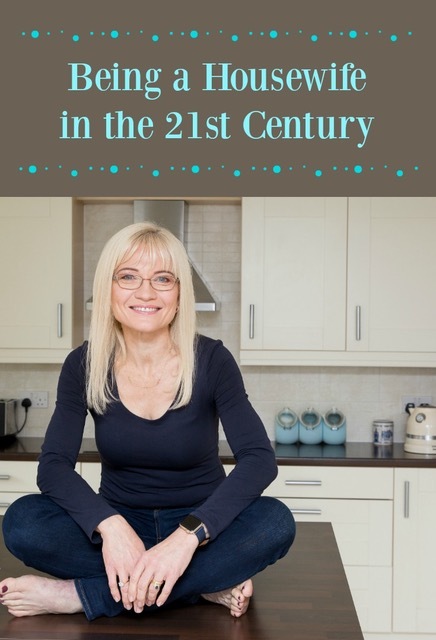 They are also brilliant for making ahead as well as for cooking once eating twice…or three times. Trust me, this is a seriously versatile recipe. Do you love your slow cooker too? Check out these delicious Slow Cooker Recipes! So, you can leave these Short Ribs in a Sweet and Spicy Sauce in the slow cooker for 8 to 9 hours. However, I prefer to cook them for about 7 hours as it means the meat usually stays on (or nearly on) the bones, perfect for an impressive presentation. I like to make the recipe a day or two ahead of time as this recipe really does benefit from time to sit and let the flavours mellow and intensify. This also means you can let the sauce cool before you thicken it with cornstarch. The advantage to that? Well short ribs are not low fat – and the sauce does end up with quite a high fat content. However if you let it cool and then refrigerate it, all the fat rises to the top and gets hard. You can then just lift the fat off and discard it, then thicken the much lower fat liquid that is left. It is definitely a great idea to make this recipe the day – or even a couple of days – before you want to eat it. I love make-ahead meals! There is something so wonderful about knowing dinner is ready for the next day – or even next couple of days. It transforms my working day, and makes me feel more relaxed all round. When the slow cooker finishes cooking, all you need to do is take the short ribs and onions out of the slow cooker, let them cool, and then put them in a sealed container in the fridge. I decant the sauce in a separate container, cool it to nearly room temperature and put it in the fridge. The fat rises and hardens on top overnight. Next day, I take the fat off the top of the sauce liquid. I thicken up the sauce with cornstarch (corn flour) on the stove top, then put the short ribs in to warm up. Yummy, and better for you too. You can also reserve some of the short ribs and the liquid for another day as they will keep for three to four days. Thicken the remaining sauce and heat the remaining short ribs for yet another meal. Or freeze some of the meat and sauce together and then thaw it another day. Short Ribs in a Sweet and Spicy Sauce are perfect served as a traditional meat and potatoes meal with vegetables, as part of a spicy rice bowl, or shredded and stuffed into pitas with crisp, fresh veggies. One of the things I love to do second or third time around is shred the meat and heat it in some of the gravy. Then I serve it in crusty rolls with sautéed onions and lots of fixing. It’s like pulled pork…but it’s beef short ribs, and it’s seriously yummy. However you serve them, my Sweet and Spicy Short Ribs are sure to become a family favourite. Brush slow cooker with a small amount of olive oil to prevent sticking. Lay the onion in the bottom of the slow cooker. Put the cranberry sauce, chili sauce, Worcestershire sauce, garlic, ginger, chilis (if using), basil, parsley, celery salt and pepper in a medium bowl and stir together well, breaking up the cranberry sauce. Stir in the bourbon, if using. Heat some of the oil in a frying pan and brown the short ribs in batches, adding more oil if necessary. You want the short ribs to pick up some colour, so allow about 45 seconds for each side. As each batch of short ribs is browned, arrange them on top of the onion in the slow cooker. Pour the sauce mixture over the beef, covering well. Put the lid on the slow cooker and cook for 6 to 8 hours, depending on your slow cooker. Whisk the corn starch and water mixture into the sauce and cook on high until thickened. This will take about 10 minutes. Serve the sauce over the short ribs. To make ahead (recommended), remove the short ribs from the slow cooker. Carefully remove the sauce from the slow cooker, putting it into a large pitcher or bowl using a ladle. Cool both the short ribs and sauce for about half an hour to 45 minutes, then cover and place in the fridge overnight. When ready to serve, remove the short ribs and sauce from the fridge. Place the sauce in a saucepan over medium heat and whisk in the cornstarch mixture. Allow the sauce to thicken, stirring constantly. Place the short ribs in a large saucepan and pour the warm sauce over top. Heat gently over low heat until warm through. Serve with mashed potatoes, rice or couscous and a green vegetable. i’ve never tried using a slow cooker before! I didn’t have one until a couple years ago, Anjali, but I absolutely love mine! This looks like a dish perfect for cold weather months. Warm and hearty. Will add it to my recipe box. This looks delicious! I too love my slow cooker all year long! It is great even in the summer, when I don’t want to heat up the whole house with the oven or stove. Thanks for sharing! Luci’s Morsels | fashion. food. frivolity. 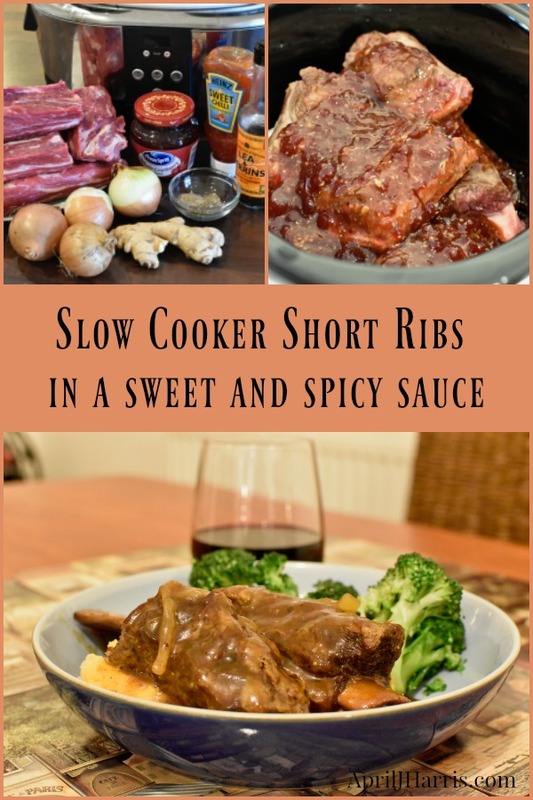 A classic comfort food dish – of course, anything made in the slow cooker gives you that lovingly tended – home cooked feel. Don’t you think? I love short ribs, they’re my favorite when it’s cold outside! I love my slow cooker, too! And this sounds yummy — as usual! You’re a great cook! I’m going to give this a whirl. Thank you so much, Nina! Please let me know what you think when you make it 🙂 It’s definitely a favourite round here! 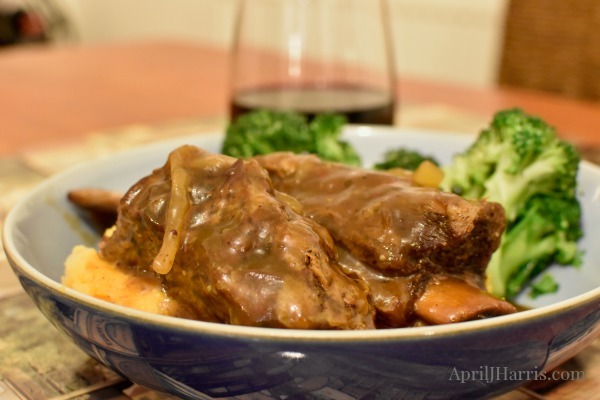 April, what a brilliant way to cook beef ribs in the slow cooker! I just know my family will adore this recipe…thank you for sharing with us. 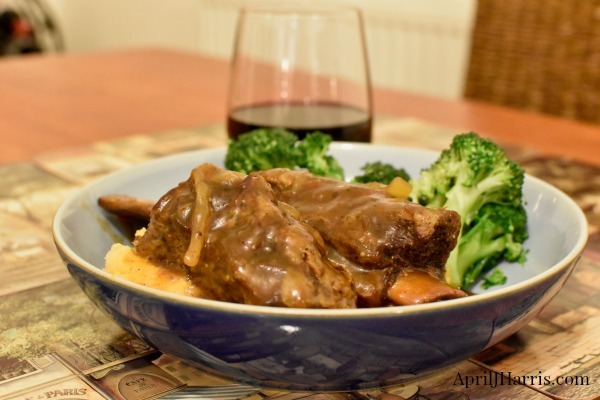 April, this is a fabulous Short Rib recipe, I just love the combination of flavor for this recipe. Hope you are having a great day and thanks so much for sharing your post with us at Full Plate Thursday. Delicious! I need to give your recipe a try:). Thanks for sharing at Funtastic Friday. These Ribs look fantastic! Hope you have a very special holiday and thanks so much for sharing with us at Full Plate Thursday. Thank you so much, Miz Helen! I am so looking forward to Easter 🙂 Happy Easter to you and yours!